Picture the scene. A damp and cold winter's day. A muddy pitch somewhere on the Isle of Wight; perhaps at Wroxall where the home side are playing a works team from the aircraft builders Saunders Roe. Twenty-two sodden footballers kicking one of those old T-balls, heavy with dubbin and mud. By half time it resembles a huge Christmas pudding, of the kind Lord Snooty and his pals ate every week in the Beano. A burly full-back takes a mighty kick. The ball travels downfield into the Saunders Roe half, where it takes a series of bumps and bounces as it skids across the surface water. The match ends and this 1920's game is soon forgotten. But did the memory of that heavy ball skipping across the wet surface strike a chord many years later in the memory of one of the young Saunders Roe players? Could that have helped the player, by then the eminent Professor Barnes Wallis, perfect his famous Dambuster bouncing bomb? Who knows, but it's an interesting thought to start our look back on 100 years of football on the Island. Prof. Wallis did work for Saunders Roe and local legend has it he did play in the Island League - and who am I to mess about with a little bit of local folklore, especially when it's as good as that? The Island League started 100 years ago when the founder members of what was to become the Isle of Wight Football Association met at Warbertons (now Calverts) Hotels, Sea Street, Newport. This was September 1898 and they laid down the ground rules for a league that was to grow out of all recognition. Certainly few, if any of the 13 members that were present could have visualised what would become of their embryonic league. They started with just I7 teams playing in two divisions. 100 years and some 500 teams later, there are 70 sides competing in five divisions. As well as their league fixtures, local teams are involved in 12 cup competitions. Some 40 teams play in the Sunday League competing in six cup competitions. Island teams play in the Hampshire, Wessex and Southern leagues and local football is a vibrant active part of weekend activities. But all this was but a distant dream when that inaugural meeting took place. The recognized date when officially-sanctioned league football began on the Island, was September 3, 1898, however we must not forget that long before this organized football was played locally on an ad hoc league basis. In the Cowes area it was run by I.W. Football Executive and controlled by Cowes F.C., then playing in the old Southern League. There was a similar situation in the Ryde area. There the Ryde and District League was run from the home of Ryde Sports at Partlands. 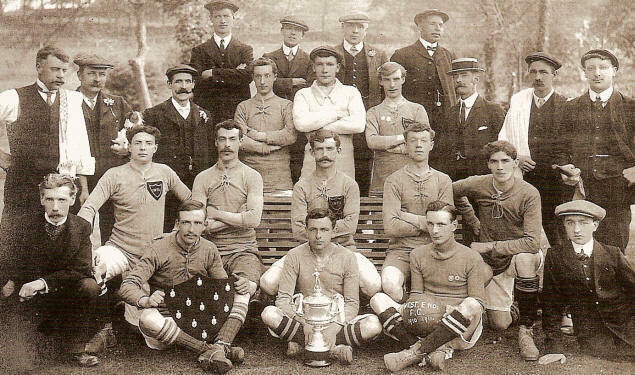 This league eventually disbanded, but the title-trophy is still played for annually as the Ryde and District Cup. The newly-formed Island League kicked off on Saturday, October 17, 1898. Of those original 17 teams, four are still playing today. The founding four are East Cowes Vics (who were to become the first champions), Newport, Bembridge and Ventnor. At this time, Cowes, Ryde and Sandown (Bay) were playing in the Southern League. By the start of 1905-6 season, a further four teams had joined. Division 2 was split into East and West sections, with a title play-off game determined the championship. The 1912-13 season brought about a mid-week league. This was for the players who worked on Saturday afternoons and was played on a Wednesday or Thursday afternoon, depending on the early-closing day. Officially, the Island Football League programme ceased in 1914 with the onset of the Great War. However there is some evidence that 'friendly' leagues existed. There was definitely a Cowes Works League that played for the trophy that was later to become the Junior Cup. After the war, the local football scene expanded, following the return of man from service. There are poignant reminders of the tragic effects of the "War to end all , as the I.W.F.A. handbook for 1921 reveals. It has a painfully-long roll of honour, with 140 Island players killed in action. There was also the entry of teams like Freshwater and Cowes Comrades. These were made up to former Army players anxious to maintain friendship of the war years. The league had now grown to 42 teams. To accommodate this increase a third m was introduced. By the start of the 1923-24 season, this like the second division, expanded into east and west sections. A total of 49 teams were now playing in the Saturday league, plus a mid-week section. From the middle of the twenties until the outbreak of hostilities in 1939, Island football settled into a well-organized pattern, highlighted by the success of local sides in the Hampshire League and their amazing string of Hampshire Senior Cup victories. During the Second World War, league football did continue albeit on a much-reduced Newport and Ryde Sports withdrew from county football and reverted to the Island League. Cowes, however, continued to play in a mini Hampshire League. Many of the who made up the wartime Island League were from service units, and service players augmented most local sides. Following the restart of Hampshire and Island League football after the Second I War, the league continued to expand. From 49 teams in 1946, to 52 by the start of 1970. By then, sides like Long Common, Shanklin Rangers, DROB (the famous Cowes side, Denmark Road Old Boys), Ventnor Rangers, East Cowes Nomads and Ryde St. Johns were to be replaced by factory teams like J. Arthur Dixon, Ratseys, Whitecroft, Plessey and British Hovercraft Corporation). In 1952 a fourth division was added. However, the association found that some clubs had difficulties getting players to turn out for a side playing 'only' in the fourth division. 1 spell of ten years, this was dropped and the teams were split into division 3, east and west. In 1967, with the league continuing to expand the decision was made to form two combination divisions. These were to be for reserve teams only. In 1969 came the introduction of officially-recognised Sunday League football. It was to expand from 10 teams in one division to a peak of almost 40 teams competing in three divisions, with promotion and relegation. Island teams were to go on to win the Hampshire Intermediate Cup four times. Sunday football was to have a dramatic effect on local football. That, then is a brief summary of the history of the Isle of Wight Football Association. now look at how it was formed, and how, over the years, it evolved into what it has become today.